'MOSH SPLIT' is a 45-minute long, out door show, which has been performed around Finland and in several European countries, including Germany, Norway, Denmark, Lithuania, Latvia, Sweden, the Netherlands, Poland and UK since 2016. This energetic show is built around a crazy camper van, flexible legs and a 10 meter high truss structure. 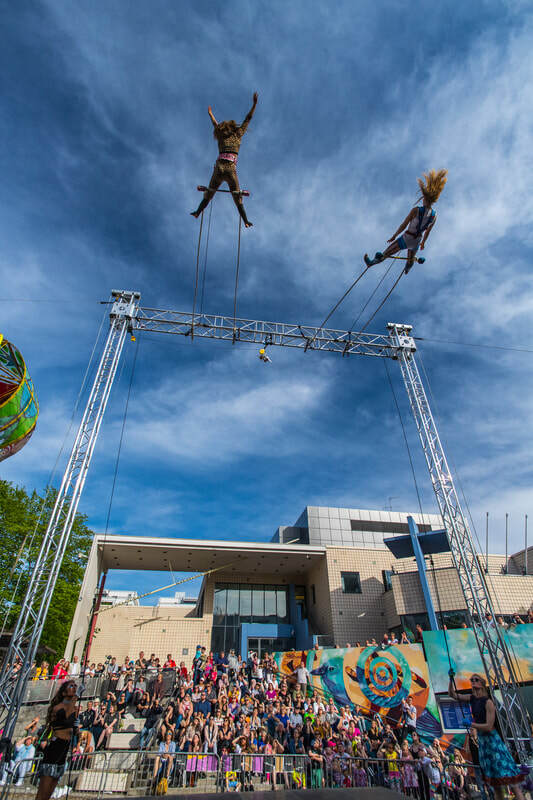 The show consists of high level circus skills and several disciplines including two simultaneously swinging trapezes, skipping rope, pair acrobatics and Washington trapeze. When the doors of the van open, toilet paper will become a huge, hypnotic skirt and vacuum cleaners turn into hairdressers helpers! This is what Mosh Split is made of! "Suomi people do it better"
"The best circus from Finland"
"Loved the Fresh and unrestricted style of Sisus"
Financial Support: Circus Arts, Finnish Cultural Foundation, The Arts Promotion Centre Finland, Svenska kulturfonden. *On tour 2019 Rosa Tyyskä is replaced by Heidi Latva. The performance does not have Cyr wheel, but instead it will contain rollerblades..